This series provides critical information regarding paleoearthquake parameters such as earthquake timing, recurrence, displacement, slip rate, and fault geometry, which can be used to characterize potential seismic sources and evaluate the long-term seismic hazard presented by Utah’s Quaternary faults. Fault behavior and earthquake recurrence on the Provo segment of the Wasatch fault zone at Mapleton, Utah County, Utah – Paleoseismology of Utah, Volume 1, 1991, by Lund, W.R., Schwartz, D.P., Muvey, W.E., Budding, K.E., and Black, B.D. : Utah Geological Survey Special Study 75, 41 p.
Paleoseismic analysis of the Wasatch fault zone at the Brigham City trench site, Brigham City, Utah and the Pole Patch trench site, Pleasant View, Utah – Paleoseismology of Utah, Volume 2, 1991, by Personius, S.F. : Utah Geological Survey Special Study 76, 39 p.
The number and timing of paleoseismic events on the Nephi and Levan segments, Wasatch fault zone, Utah – Paleoseismology of Utah, Volume 3, 1991, by Jackson, M.: Utah Geological Survey Special Study 78, 23 p., 3 plates. Seismotectonics of north-central Utah and southwestern Wyoming – Paleoseismology of Utah, Volume 4, 1994, by West, M.W. : Utah Geological Survey Special Study 82, 93 p., 5 plates, scale 1:100,000. Neotectonic deformation along the East Cache fault zone, Cache County, Utah – Paleoseismology of Utah, Volume 5, 1994, by McCalpin, J.P.: Utah Geological Survey Special Study 83, 37 p.
The Oquirrh fault zone, Tooele County, Utah – surficial geology and paleoseismicity – Paleoseismology of Utah, Volume 6, 1996, by Lund, W.R., editor: Utah Geological Survey Special Study 88, 64 p., 2 plates, scale 1:24,000. Paleoseismic investigation on the Salt Lake City segment of the Wasatch fault zone at the South Fork Dry Creek and Dry Gulch sites, Salt Lake County, Utah – Paleoseismology of Utah, Volume 7, 1996, by Black, B.D., Lund, W.R., Schwartz, D.P., Gill, H.E., and Mayes, B.H. : Utah Geological Survey Special Study 92, 22 p., 1 plate. Paleoseismic investigation at Rock Canyon, Provo segment, Wasatch fault zone, Utah county, Utah – Paleoseismology of Utah, Volume 8, 1998, by Lund, W.R., and Black, B.D. : Utah Geological Survey Special Study 93, 21 p., 2 plates. Paleoseismic investigation of the Clarkston, Junction Hills, and Wellsville faults, West Cache fault zone, Cache County, Utah – Paleoseismology of Utah, Volume 9, 2000, by Black, B.D., Giraud, R.E., and Mayes, B.H. : Utah Geological Survey Special Study 98, 23 p., 1 plate. Post-Bonneville paleoearthquake chronology of the Salt Lake City segment, Wasatch fault zone, from the 1999 “megatrench” site – Paleoseismology of Utah, Volume 10, 2002, by McCalpin, J.P.: Utah Geological Survey Miscellaneous Publication 02-7, 38 p.
Post-Provo paleoearthquake chronology of the Brigham City segment, Wasatch fault zone, Utah – Paleoseismology of Utah, Volume 11, 2002, by McCalpin, J.P., and Forman, S.L. : Utah Geological Survey Miscellaneous Publication 02-9, 46 p.
Neotectonics of Bear Lake Valley, Utah and Idaho; a preliminary assessment – Paleoseismology of Utah, Volume 12, 2003, by McCalpin, J.P.: Utah Geological Survey Miscellaneous Publication 03-4, 43 p.
Holocene earthquake history of the northern Weber segment of the Wasatch fault zone, Utah – Paleoseismology of Utah, Volume 13, 2006, by Nelson, A.R., Lowe, M., Personius, S., Bradley, L., Forman, S.L., Klauk, R., and Garr, J.: Utah Geological Survey Miscellaneous Publication 05-8, 39 p., 2 plates. Paleoseismic investigation and long-term slip history of the Hurricane fault in southwestern Utah – Paleoseismology of Utah, Volume 14, 2007, by Lund, W.R., Hozik, M.J., and Hatfield, S.C.: Utah Geological Survey Special Study 119, 81 p., compact disk. Surficial-geologic reconnaissance and scarp profiling on the Collinston and Clarkston Mountain segments of the Wasatch Fault Zone, Box Elder County, Utah – paleoseismic inferences, implications for adjacent segments and issues for diffusion-equation scarp-age modeling – Paleoseismology of Utah, Volume 15, 2007, by Hylland, M.D. : Utah Geological Survey Special Study 121, 18 p., compact disk. Paleoseismic reconnaissance of the Sevier fault, Kane and Garfield Counties, Utah – Paleoseismology of Utah, Volume 16, 2008, by Lund, W.R, Knudsen, T.R., and Vice, G.S. : Utah Geological Survey Special Study 122, 31 p., compact disk. Paleoseismic investigation of the northern strand of the Nephi segment of the Wasatch fault zone at Santaquin, Utah – Paleoseismology of Utah, Volume 17, 2008, by DuRoss, C.B., McDonald, G.N., and Lund, W.R.: Utah Geological Survey Special Study 124, 33 p., 1 plate. Paleoseismic investigation of the northern Weber segment of the Wasatch fault zone at Rice Creek trench site, North Ogden, Utah – Paleoseismology of Utah, Volume 18, 2009, by DuRoss, C.B., Personius, S.F., Crone, A.J., McDonald, G.N., and Lidke, D.J. : Utah Geological Survey Special Study 130, 37 p., 2 plates, compact disk. Late Quaternary faulting in East Canyon Valley, Northern Utah – Paleoseismology of Utah, Volume 19, 2010, by Piety, L.A., Anderson, L.W., and Ostenaa, D.A. : Utah Geological Survey Miscellaneous Publication 10-5, 40 p., CD. 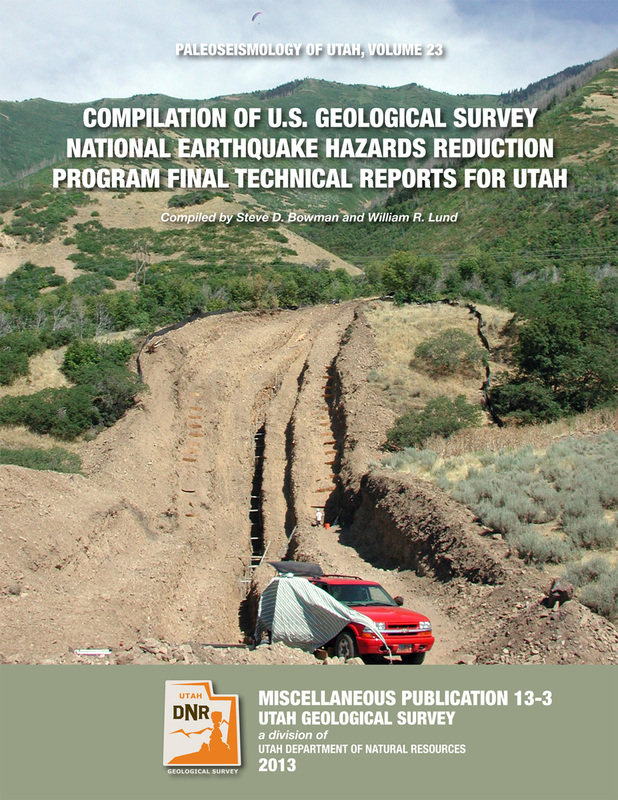 Compilation of U.S. Bureau of Reclamation seismotectonic studies in Utah, 1982-1999 – Paleoseismology of Utah, Volume 20, 2011, by Lund, W.R., Bowman, S.D., and Piety, L.A.: Utah Geological Survey Miscellaneous Publication 11-2, 4 p., CD. Compilation of 1982-83 seismic safety investigation reports of eight SCS dams in southwestern Utah (Hurricane and Washington fault zones) and low-sun-angle aerial photography, Washington and Iron Counties, Utah, and Mohave County, Arizona – Paleoseismology of Utah, Volume 21, 2011, by Bowman, S.D., Young, B.W., and Unger, C.D. : Utah Geological Survey Open-File Report 583, 4 p., 2 plates, six DVD set.